AUGUSTA, Ga. -- Four-year-old Norah Wood of Augusta, Georgia, went with her mother to the grocery store to buy some birthday cupcakes. She ended up changing a life. It started late last month with some simple kind words she shouted to a lonely older man in the aisle. He was taciturn and "stone-faced" Norah's mother, Tara Wood, told CNN on Thursday. "Hi, old person!" Norah yelled from her cart. "It's my birfday today!" The man's face lit up. "How old are you today?" he asked. They chatted briefly and even exchanged hugs. "It was only a 10-minute encounter at the grocery store, but it felt magical and divine," the mom said. Mother and daughter left with a happy memory, and a photo Norah insisted her mother snap. That could have been the end of the story. But it is actually the beginning of a special relationship. When Tara Wood posted that photo on Facebook, someone recognized the gentleman, passed along his contact information and wrote, "That's the first time I've seen that man smile since his wife died." Dan Peterson, 82, lost his beloved wife in March and fell into deep depression. 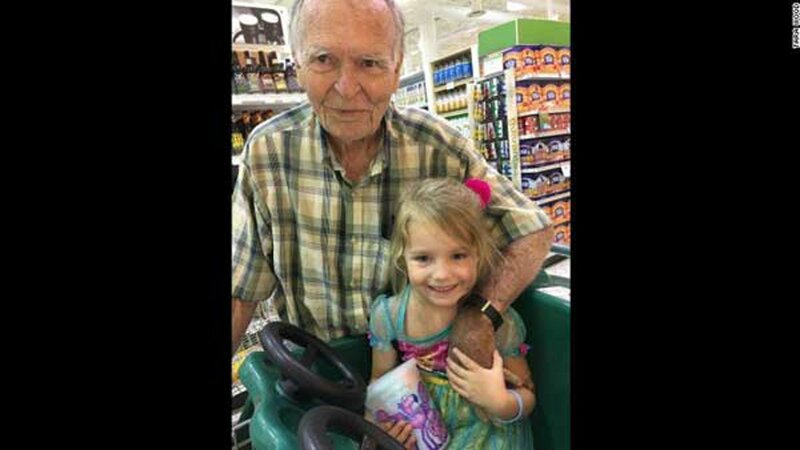 Six months later, he had his chance encounter with Norah at the store. "That day, I was going through a day of self-pity. I was just feeling sorry for myself," he told CNN. "But she changed it." With a fresh shave and haircut, Peterson invited the mother and daughter to his home. In the weeks since, the Wood family has built a loving relationship with the man they call "Mr. Dan." He plans to spend a day around Thanksgiving with Norah, her parents and six siblings. "She has shown me a depth of love, a depth I didn't know existed," Peterson told CNN. "If you just take the time to notice people, you never know how you can positively impact a life," Tara Wood said.